The Golden Ratio and Understanding the Universe | Blah! When you stop and think about it, it is truly astonishing how well we can describe the universe around us using mathematics. That equations as simple as F=ma and E=mc^2 can describe so much of what we observe is really amazing. 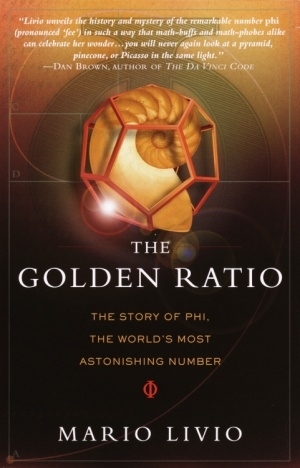 The Golden Ratio by Mario Livio is essentially an examination of one of the most remarkable numbers to be discovered as a pretext for ultimately exploring the question why do mathematics work so well. The golden ratio, known from the time of the ancient Greeks, is a pretty simple concept: take a line (defined by points A and B) and divide it (at point C) such that the length of the entire line over the length of the longer portion of the division is the same as the length of this longer portion over the shorter portion. That is, if the longer portion is CB and the shorter is AC, then AB/CB=CB/AC. A pretty simple concept and definition. It turns out, this has many profound consequences. This golden ratio, normally dubbed phi by mathematicians, is one of the first irrational numbers discovered and is, in some sense, the most irrational of all. It shows up in many branches of math, especially geometry, and has been observed in nature in the patterns formed by petals on flowers, the seeds in sunflowers, the shape of certain seashells, and the shape of galaxies. It is ubiquitous in nature. Why should that be so? That is the real point of Livio’s book. Livio spends a lot of time on the history of phi, how it was discovered, how it was understood, and what it means to math and science. When he is focusing on the role of phi in science, the book is wonderful. There were many very interesting insights that I was unaware of that were real gems to discover. Livio also spends a lot of time on the supposed role the golden ratio played in art, poetry, music, and architecture, including the constrution of the pyramids of Egypt. His goal is to debunk those who claim that the golden ratio was an instrumental part in many such works, and he does so convincingly. Unfortunately, I found this a huge distraction and very uninteresting. I would much rather that he had filled those pages with more discussion of how the golden ratio is found in nature and science. I understand that he felt a need to determine where the golden ratio is really to be found, but I felt it was over done. Ultimately, the fact that the golden ratio, and by extension math as a whole, figures in so much of what we see around us leads Livio to examine why that is so. He describes two alternative views. First, that the universe is objectively Platonic; that humans are discovering the laws of the universe and those are written in the language of math. Any civilization in the universe would uncover the same mathematical laws. The second view is that math is a human language, a human construct, and we are using it to interpret our observations of the universe. Civilizations with different formulations of mathematics would have a different view of how the universe works. Livio falls somewhere in the middle, and, to be honest, I did not overly understand his reasoning for his position. It is an interesting question. I guess I would tend a bit more towards the Platonic view. I think that it is just too striking that our math and physics can not only describe but predict what is happening around us so well. I once had a chat with a fellow grad student at the UW physics department that was about this. His point, as far as I could understand, is that maybe we create the reality around us via our investigations and our interpretations of our observations. Essentially, that there is no objective reality, that reality is created by the observer. Thus, as we develop our math, we view the universe through that math and thus shape it to conform to our math. This “the observer shapes reality” perspective seems like an extreme view of the Copenhagen interpretation of quantum mechanics. I definitely wouldn’t go so far as this. But, it is an interesting question.